Facebook has learned that some things aren’t worth doing if you don’t do them right. 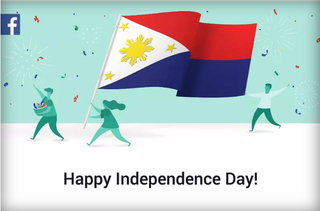 Over the weekend, the social network made a “happy independence day” graphic for users in the Philippines (of which there are about 52 million) to share to commemorate the country’s 1898 independence from Spain. That’s all very nice, except it got the colors of the flag wrong and Philippine law mandates that the flag’s colors are only inverted—with red on top and blue on bottom instead of the other way around—when the country is at war. If it makes Facebook feel any better, it’s not alone in making this gaffe, and there have been even more embarrassing circumstances. In 2010, President Obama hosted a meeting for President Benigno Aquino III—and hoisted the Philippine flag inverted as well. Guess there’s no situation so important that people will make extra sure a flag is shown right-side-up.